US 1938, 76 minutes, black and white. Barbara Stanwyck, Herbert Marshall, Ian Hunter, Cesar Romero, Lynn Bari, Binnie Barnes, Johnny Russell, Franklyn Pangborn. This is what used to be called a woman’s picture, a focus on a sympathetic central character and her struggles. This time it is Barbara Stanwyck, waiting on a New York Street for her husband-to-be for the wedding and his being killed in front of her in a car accident. 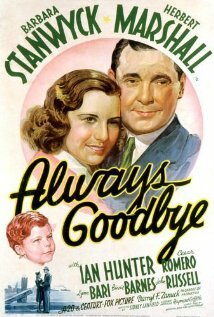 She feels suicidal but is rescued by a kind scientist played by Herbert Marshall. She gives up her baby for adoption to two friends of the scientist who also gets her a job in the high fashion store, managed by Binnie Barnes. He disappears on a voyage for five years, during which Margot is successful in the store, and is sent to Paris to buy fashions. By chance she encounters her son, has the opportunity to be with him, and on the voyage home. His adoptive father, Ian Hunter, is a widower and plans to marry Jessica, a golddigger. He falls in love with Margot but she loves Jim and he her, but she opts to go with Roddy’s adoptive father, to be a mother to her child and never to reveal the truth. The year before Barbara Stanwyck are played in Stella Dallas, a different story about bringing up an illegitimate child. 1. A so-called ‘woman’s picture’ In the past? The soap opera touches, drama, romance, melodrama? 2. 1938 setting, black and white photography, New York City, Paris? The musical score? 3. The title, Margot: losing her husband, losing Roddy, losing Jim? 4. The meeting in the street, crash, wanting to kill herself, rescued by Jim, the birth of the baby, the decision for adoption, the Marshall couple, her pledge not to reveal the truth, Jim getting her the job with Harriet, the work in the store? 5. Jim, the loner, doctor, the voyages with the cows, rescuing Margot, arranging the adoption, absent for five years, his return, Margot happy, his love for Margot? 6. Margot and her going to Paris, the fashion world, the encounter with the Count, the comic touches of his always turning up, flirting? Meeting of Roddy at the hotel, his nurse, ill, playing with him, the decision for the voyage, the bonding on the ship? 7. With Jim, the, wanting to have the Roddy, Jessica at the shop, her going to the bicycle store and meeting Philip, the meetings at the house, going biking with Roddy and Philip, the confrontation with Jessica about Roddy’s future, Philip hearing it, Philip and his love for Margot? 8. Jessica as a character, gold-digger, Philip has a catch, sending Roddy to military school, the flirtation with the Count? 9. Roddy and his verve? Bonding with Margot? 10. The Count, the comic touches, pursuit of women? Jessica? 11. Margot and her love for Jim, the promise not to tell Philip the truth, marrying him, being a mother to Roddy?